iPhone X Won’t Restore and Updating or Unable to restore a backup on iPhone X. Most of the iPhone X users worried about move all data from old iPhone to New iPhone X. Apple Suggest restore process on new iPhone, in two ways we can restore whole data from old iPhone to new iPhone X. Using iTunes or iCloud, So people are struggling with iTunes error on restore and incomplete restore process during iCloud Backup restore. iPhone X keeps restarting itself in restore process: iTunes saying, “iTunes Could not restore the iPhone Because an error occurred”. Check free space and manage storage by removing unwanted data or app. Go to the Settings App on iPhone > General > iPhone Storage. Scroll down and check which types of data consume most of the iPhone Space. For Example Photos, Podcasts, Mail app, Pages, GarageBand, iMovie, List of other third-party apps and more. You need to wait for long for Gigabytes of Data Restore. For this case, restore using iTunes is only great way compare to iCloud. Maybe some antivirus software is blocking and an interrupting connection between iPhone and iTunes. Uninstall, Disable antivirus functionality temporary. First Check for Update, it will help to fix all internal error while iPhone X Won’t Restoring Backup from iTunes or iCloud. To Backup or Restore we need the latest version of iTunes on Mac or PC. More: Update iTunes on Mac or PC. After erasing all content and Settings, we must need to update iOS at first. Force Restart refixes all internal problems quickly by hard reset or Force Restart. To Force Restart iPhone X: Press and Quickly release Volume up button, after that Press and Quickly Release Volume down button. And Press and Hold Side button until you see the apple logo on the screen. 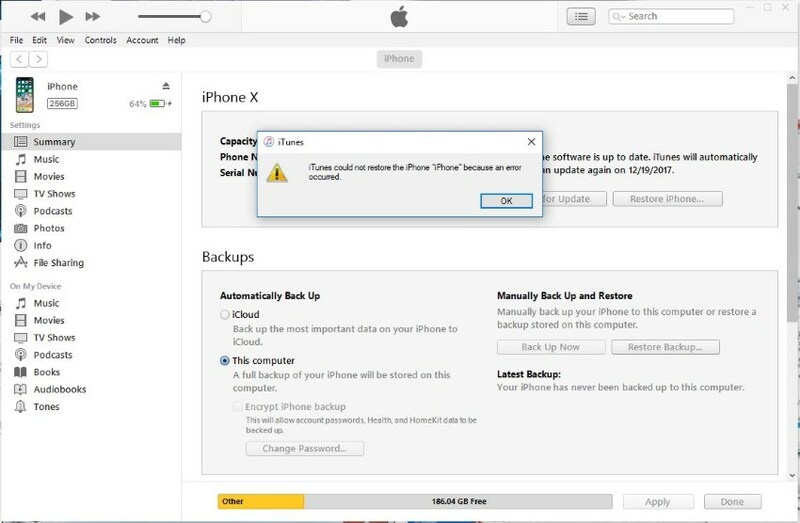 Be careful and try this method for restoring old iPhone Data to iPhone X, First, take Full backup in iCloud (Go to the Settings > Profile > iCloud > iCloud Backup > Enable iCloud Backup toggle > Tap on Back Up Now). Now on iPhone X (Erase All contant and Settings) > Setup like New iphone > App & Data Screen > Restore From iCloud. Next to follow on-screen instruction and Restore all data to new iPhone X without any error. It will take a few hours or Days depends on your internet speed and Data size. Hope you fix guy your problem on iPhone X/XS/XR/XS Max Won’t Restoring Backup from iTunes and iCloud.